I have a lot of favorite tools for life drawing -- but enough is enough. When I go to Gage life-drawing sessions, I take a separate kit from my daily-carry gear because I tend to need different materials there. Last week I wasted half of a one-minute pose digging through my pen case (for those who are curious, it’s a Nomadic PE-18) looking for a particular brush pen because the case was stuffed. 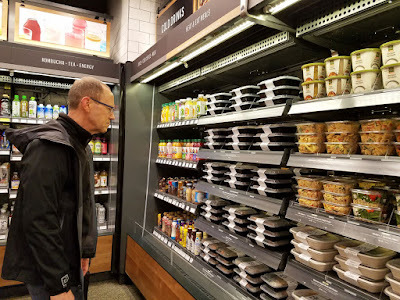 I realized the same thing happened there as happens in my daily-carry bag: Every time I acquired a tool that I think would be interesting to try at life drawing, I would put it into the case, but I wouldn’t take anything out. And while all those tools are interesting when I try them, the fact is, I tend to select by the 80/20 principle. 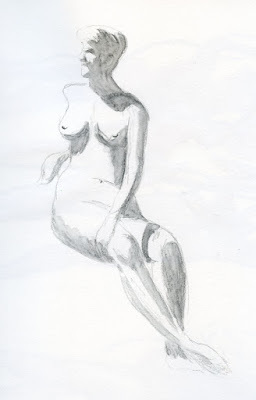 In the same way that I’m working with a minimal daily-carry sketch kit, it was time to clear out my life-drawing case. Shown above are all the tools that were in my case before I completely emptied it: 10 brush pens, a water brush, and 21 pencils – graphite, charcoal, sepia, colored, water-soluble, rainbow. 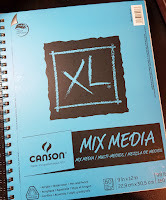 My favorite sketchbook for life drawing is a 9-by-12-inch spiralbound Canson XL 98-pound mixed media book. 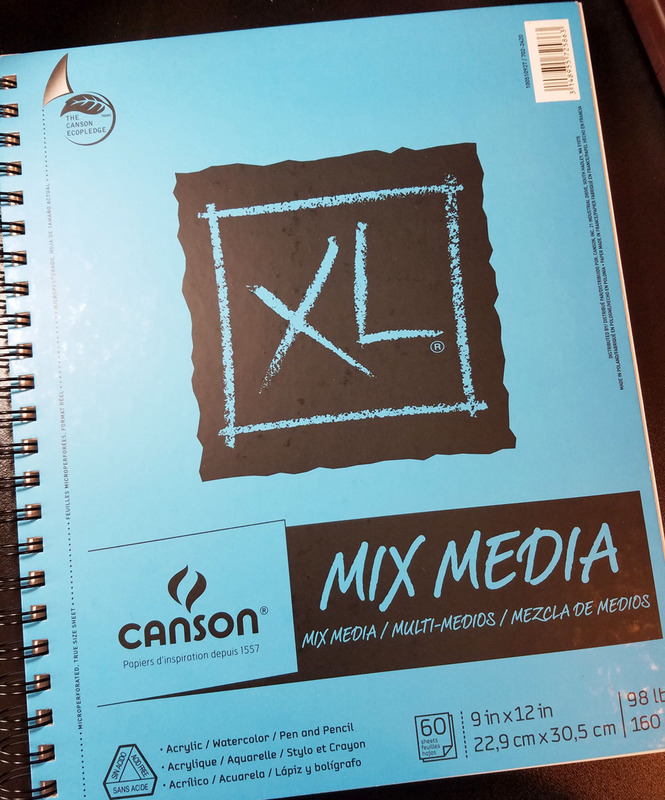 The size is large enough to make two or three poses per page, the paper is strong enough to take a light wash and use both sides of the page, and the spiral binding makes it easy to flip the pages over quickly between poses. 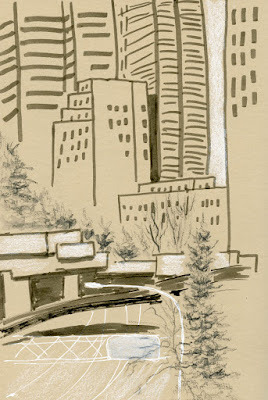 For short poses, brush pens with water-soluble ink in their reservoirs have become my go-to. 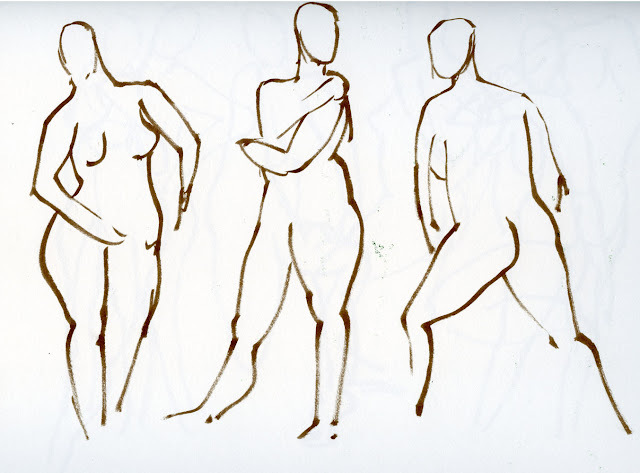 Especially for the 1- and 2-minute poses, I want the speed of a fluid medium without the fuss of watercolors. 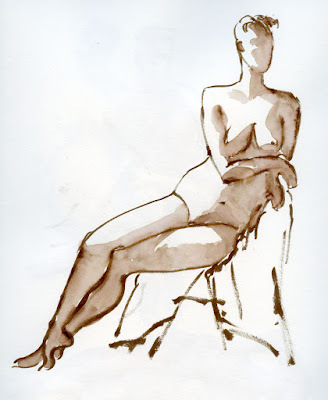 When I have 5 or 10 minutes, I still use the same brush pens to draw the pose, but I usually have time to get out a waterbrush to dissolve the ink for quick shading. For 15- and 20-minute poses, I sometimes like to use some kind of pencil so I can put in a little detail and toned shading. (Last week I tried a 10-minute pose with a water-soluble pencil, but that was pushing it.) 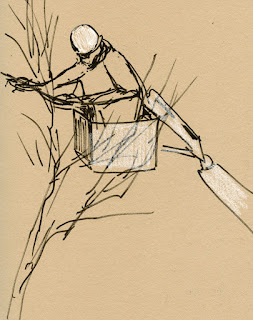 Charcoal, sepia, chunky carpenter’s pencils – I’ve tried them all, but none have grabbed me enough to keep using them. The ones I reach for most (the 80/20 principle) are water-soluble or very soft graphite pencils. 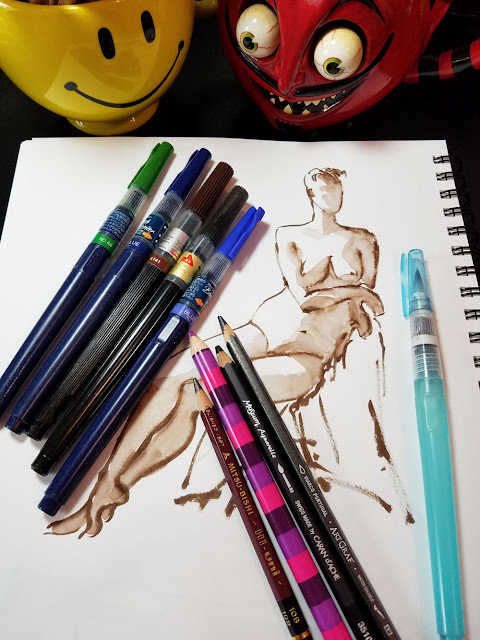 The photo below shows what I put back into my kit: 5 brush pens in assorted colors (I like to keep track of the length of the poses by changing ink colors when the length changes), a 10B Mitsubishi Hi-Uni graphite pencil, one rainbow pencil, one Caran d’Ache Museum Aquarelle pencil, an 8B Viarco Artgraf water-soluble graphite pencil, and one Kuretake broad-tip waterbrush. That’s a manageable selection to bring to life drawing sessions. I don’t have time between poses to ponder too many choices, and I don’t have time during the pose to add lots of colors and textures. As a sketcher who started straight in with ink from the very beginning, I don’t do much erasing, even when I’m using graphite. 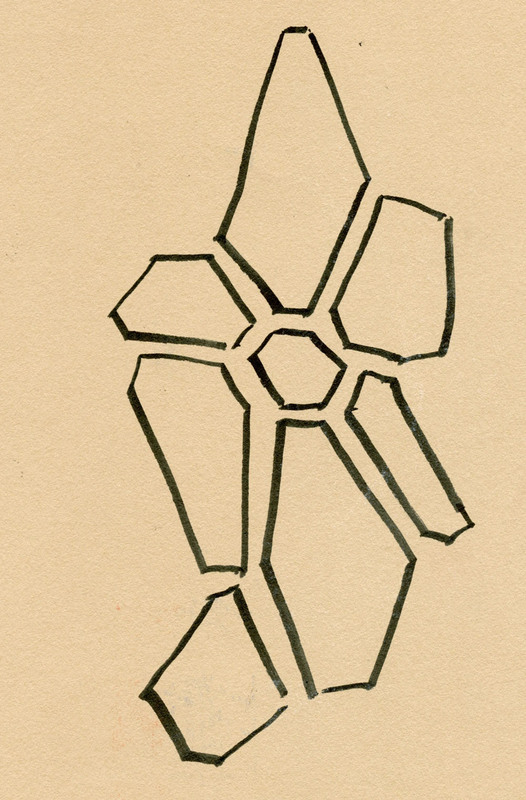 (It’s not that I don’t make mistakes; I just restate errant lines or find ways to disguise them with shading.) However, aside from deleting errors, erasers have other skills that I’ve found useful in both graphite and colored pencil drawing – chiefly, replacing lost highlights and cleaning up smears. But unlike graphite, colored pencil can be difficult to erase. 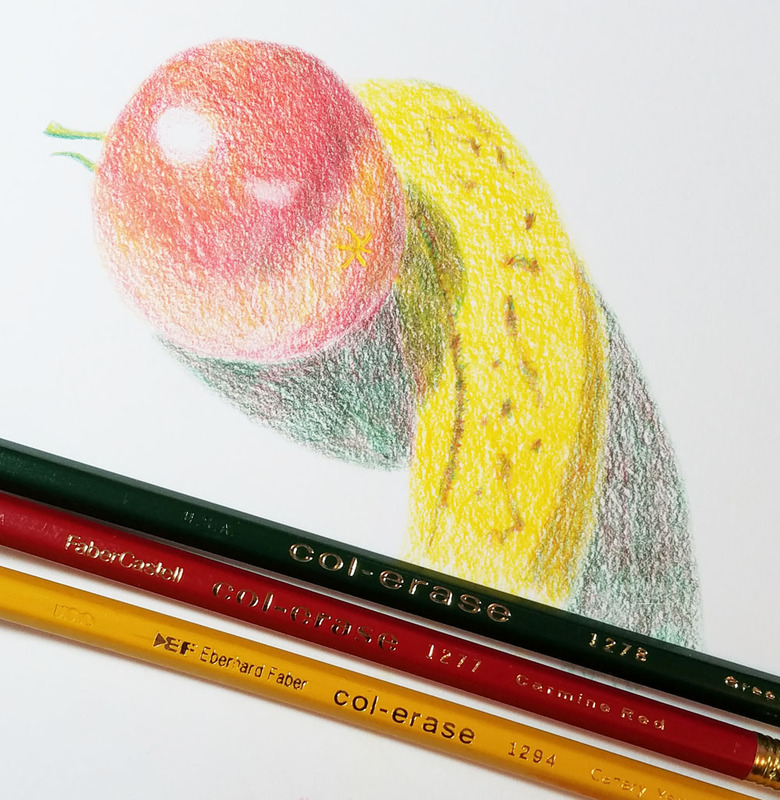 My general curiosity about all colored pencils had prompted me to get a small set of contemporary Prismacolor Col-erase colored pencils a while ago. Their claim to fame is, of course, that they are erasable. 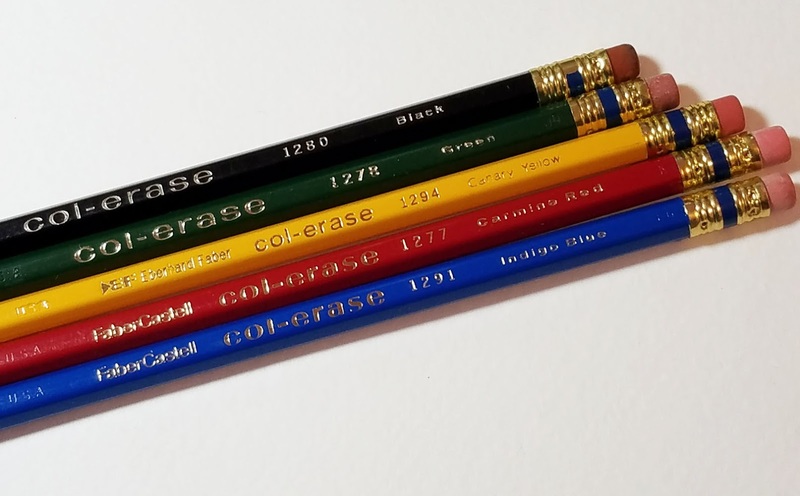 While they might be a bit easier to erase than most colored pencils, the erasure is not complete, and they are not remarkable in any other way. The attached eraser is, as expected, laughable. I decided that erasable colored pencils are a nice concept, and then put the set aside. Fast-forward to a couple of weeks ago when the batch of vintage colored pencils I received from Ana included a few Col-erase. 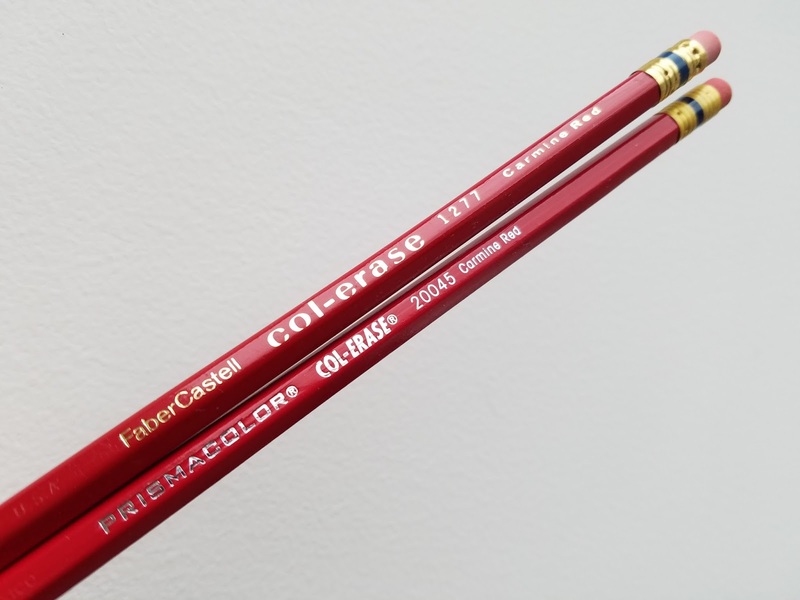 Two are branded FaberCastell (no hyphen or space); one says Eberhard Faber; and a couple are not branded other than the Col-erase name. They all have a gold-colored metal ferrule with a dark blue band. 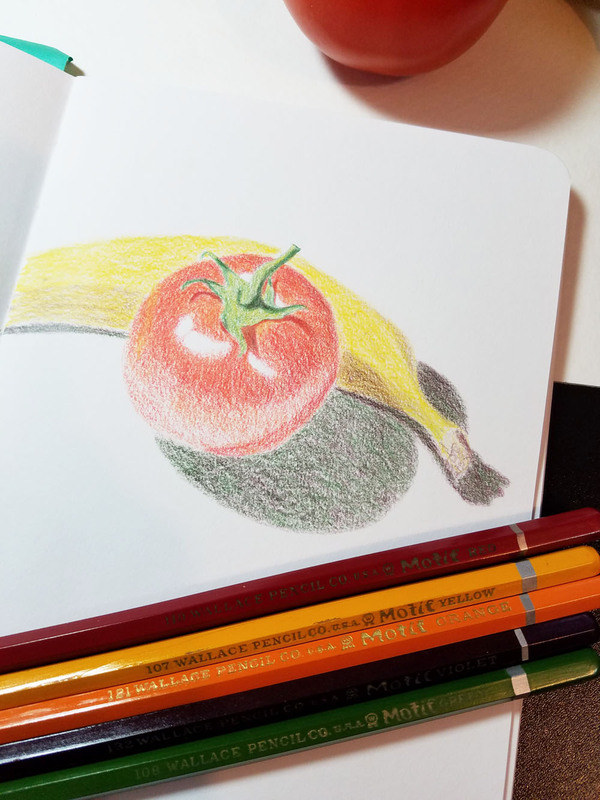 I didn’t have high hopes that they would be great for sketching, but in the interest of colored pencil science, I gave them a try. They have very hard cores – about as hard as Verithins, which are among the hardest I’ve used – but not hard in an unpleasant way. In fact, I found them relatively easy to build up color on Stillman & Birn Alpha paper. One big surprise is that their relative smoothness and point retention makes them nice for writing. I sometimes have a need for writing with color when markers or gel pens aren’t quite right, and I think these might do the trick. I bet red and blue ones would make very useable marking pencils. The second surprise was when I tested erasability. Of course, the attached erasers on the vintage Col-erase pencils were hard and useless (though probably no worse than the contemporary ones). 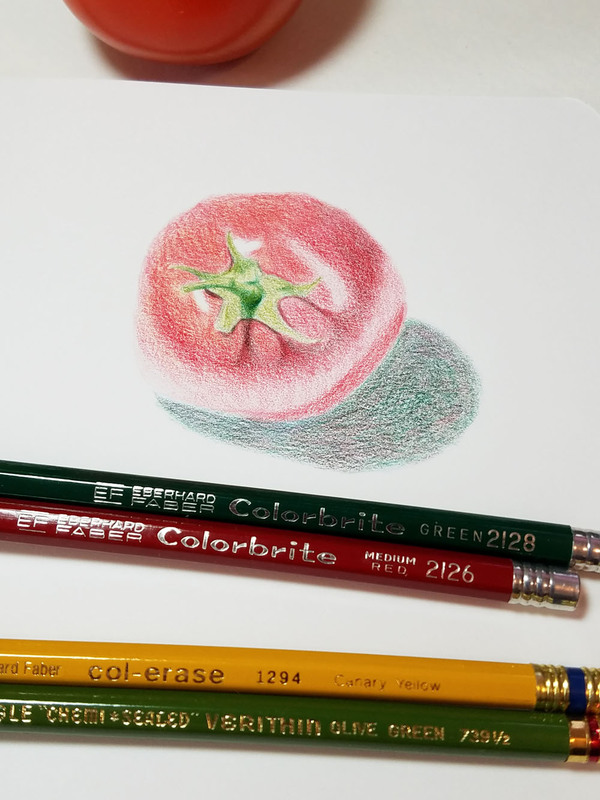 After applying multiple layers of pigment and using my trusty Tombow Mono Zero, I erased out the small secondary highlight near the center of the tomato. Though not completely erased, most of the pigment came out quickly and without much effort. Smudges cleaned up nicely, too. In the interest of research, I also compared an old Col-erase with its contemporary counterpart for erasability. Again using the Mono Zero, the vintage one erased more completely and with less effort, perhaps because the core is slightly harder. As a “control,” I tested them both against a Caran d’Ache Pablo in a similar hue, which is much softer than both Col-erase pencils. As expected, the Pablo took quite a bit of scrubbing and left behind more pigment than either Col-erase. I probably won’t be using Col-erase pencils, older or newer, for drawing, but it’s interesting to discover that the vintage ones erase more easily (another case of older is better). I’m also happy to find a use for those hard cores for writing with. This is the last installment of my vintage colored pencil series. 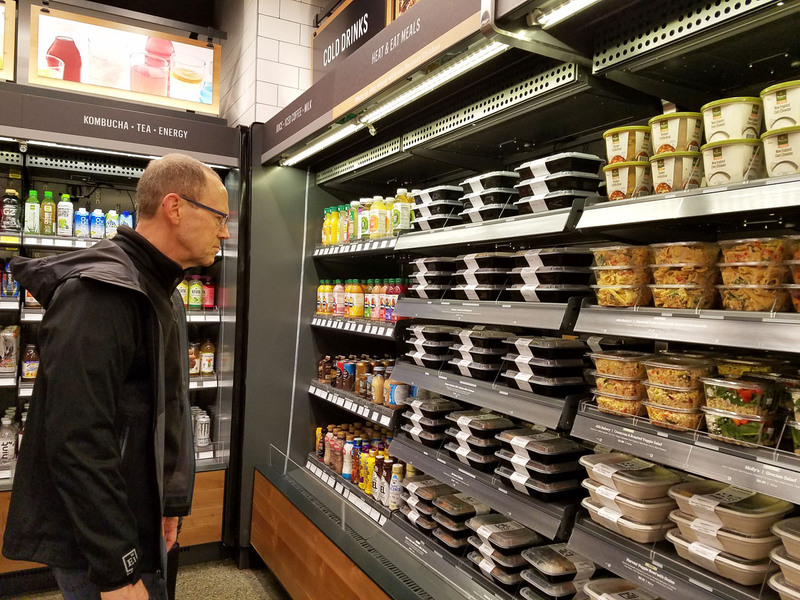 I hope you’ve enjoyed reading my “research” as much as I’ve had doing it. If you know anything about any of these old pencils, please let me know. 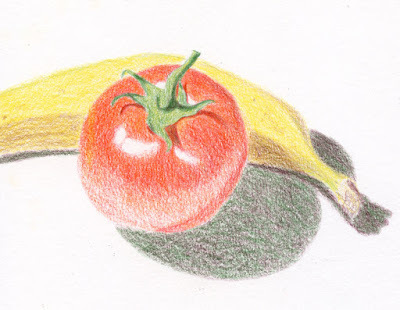 In the meantime, I’m going to continue poking around the Internet for colored pencil history. And of course I’m going to continue poking around in the pencil bins at thrift shops. 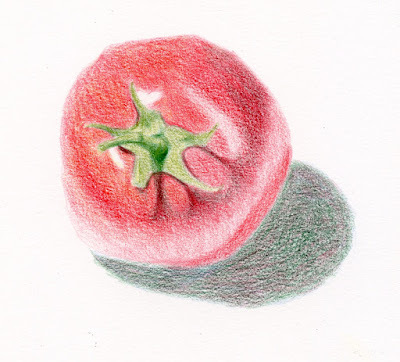 Read the rest of my vintage colored pencil series. It seems like Urban Sketchers Seattle has met fairly regularly at the Washington State Convention Center. 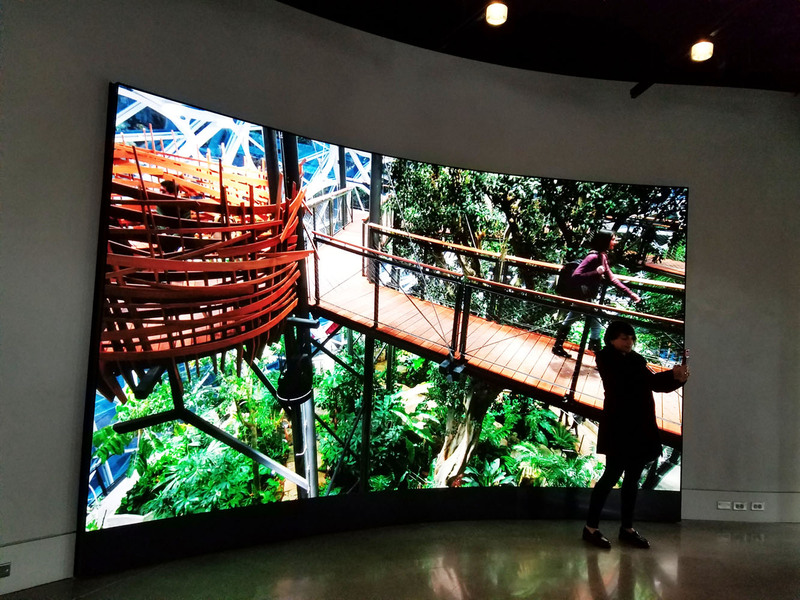 With natural light, people, plants, fantastic views and plenty of public seating all around, it’s a wintertime staple for us. 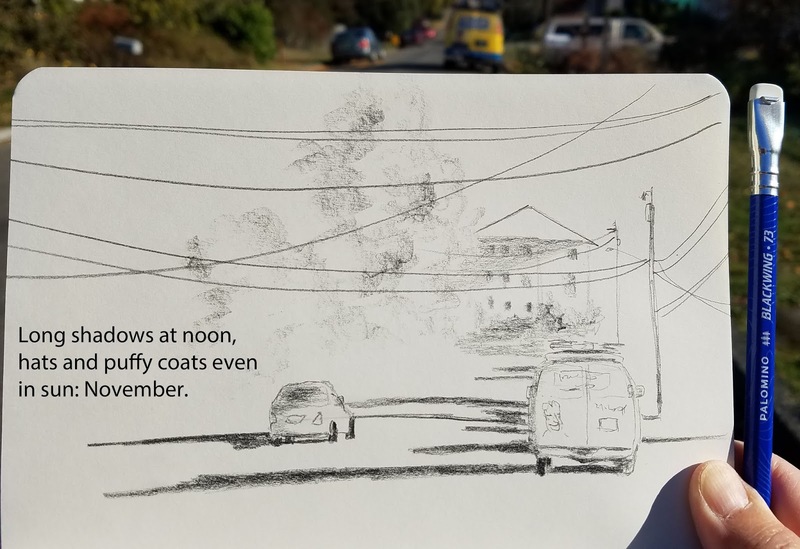 But when I checked my blog, it turns out that the last time I had sketched there was in 2013, so I must have missed an outing or two since then. I don’t know how long it’s been there, but we all noticed a striking architectural feature that was prominently displayed in the lobby: A Native American chief that once decorated the 1910 Cobb Building at Fourth and University. 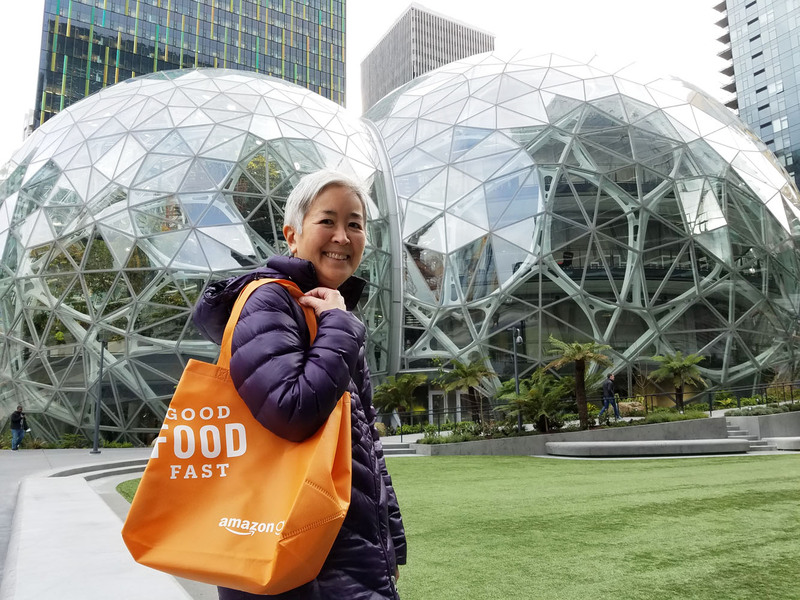 According to one news article, “The facade features large terra-cotta cartouches incorporating a stylized Indian chief’s face in full headdress. 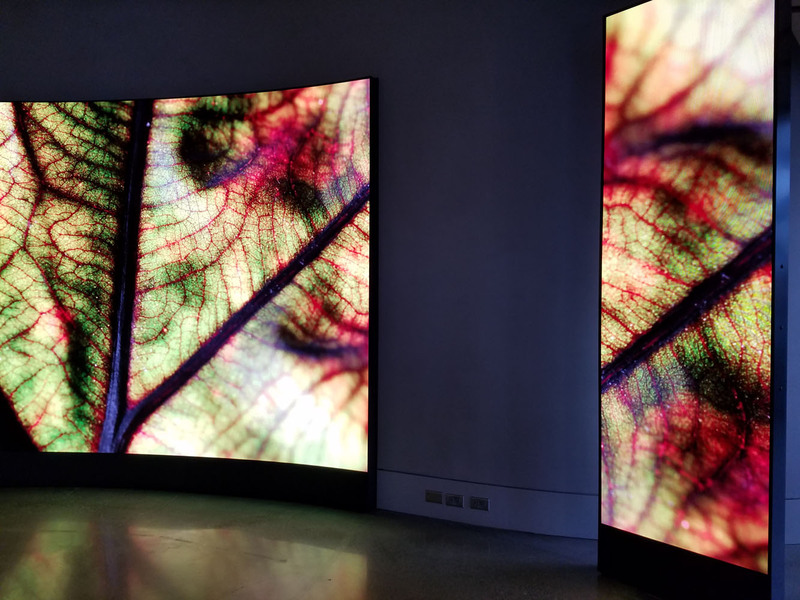 These were supposedly inspired by the photography of Edward S. Curtis.” In 2006 the former medical building was turned into apartments. 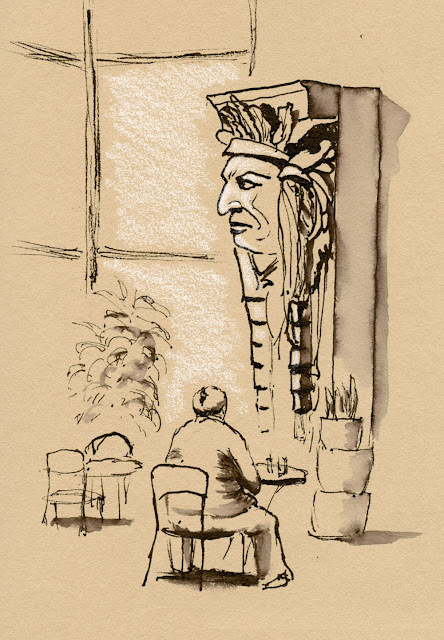 I couldn’t find information about when or why the cartouches were removed – others are apparently elsewhere in the city – but I enjoyed sketching this one (along with Kate sketching it, too) in the comfort of the lobby. 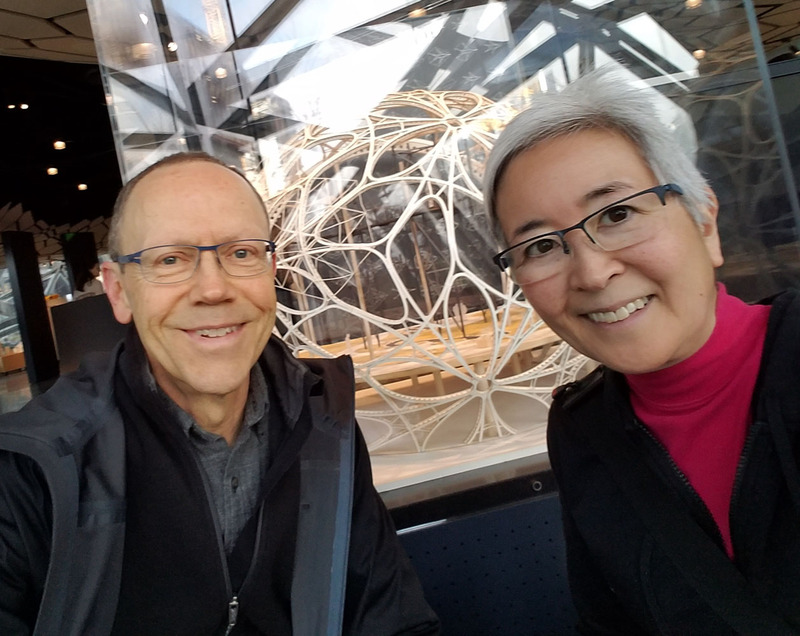 Eventually I wandered up to the top level, where floor-to-ceiling windows offer great views of downtown. 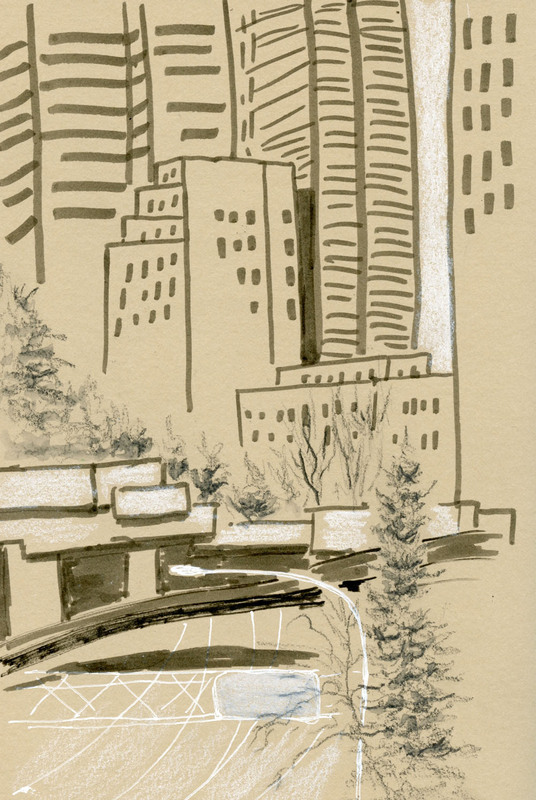 I picked a view overlooking Interstate 5, Freeway Park (where we met last summer) and lots of buildings, where I could see only a sliver a sky between them. 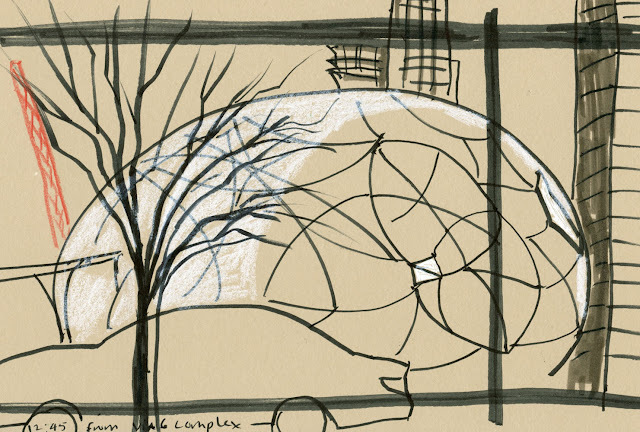 As usual, I found myself with only 15 minutes or so before the throwdown, so I looked up and chose a Freeway Park tree through a high window. The mixed lot I got on eBay included a good selection of Wallace Motif and Wallace Invader pencils. According to the National Museum of American History, “The Wallace Pencil Company began manufacturing wooden pencils in St. Louis in 1915. By 1979 it sold 120 million pencils per year. 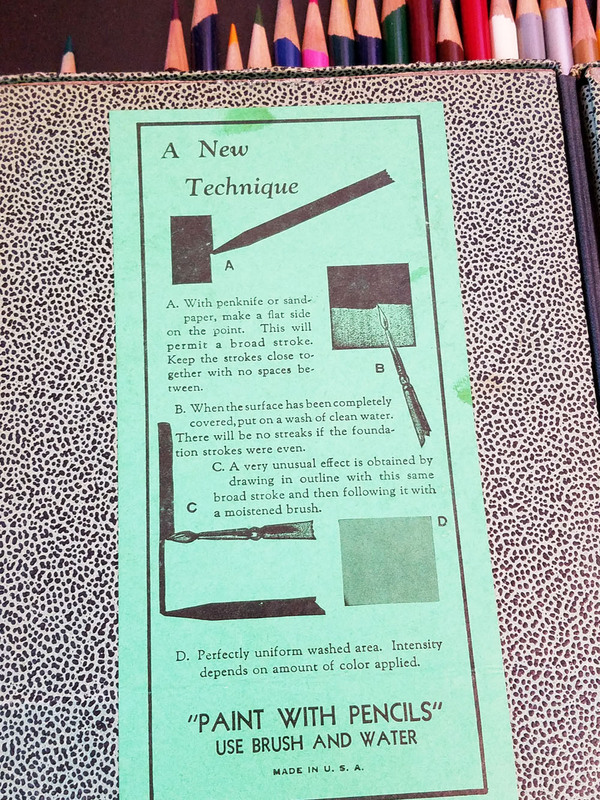 Before the 1950s, the firm packaged some of these pencils, such as its Motif line, in metal tins. 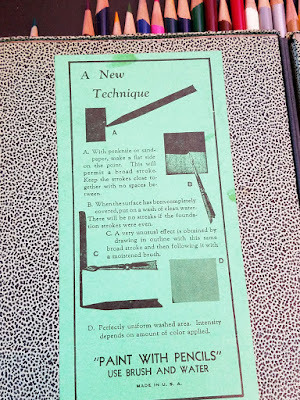 Dixon Ticonderoga acquired the firm in the 1980s.” Unfortunately, the nice photo of the tin in this article does not show the pencils that might have come in it. In any case, my small collection, most of which came unsharpened as new old stock, shows consistent branding and logos (the Motif logo is amazing!). Both the Motif line and the Invader line have lacquered ends that match the rest of the barrel, separated by a silver band. 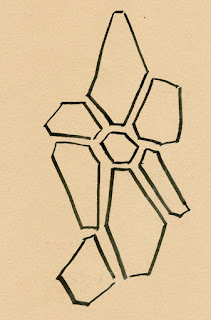 The only obvious difference between the two lines is that the Motif pencils have a very sharp hexagonal barrel, while the Invader brand has a soft hex shape. 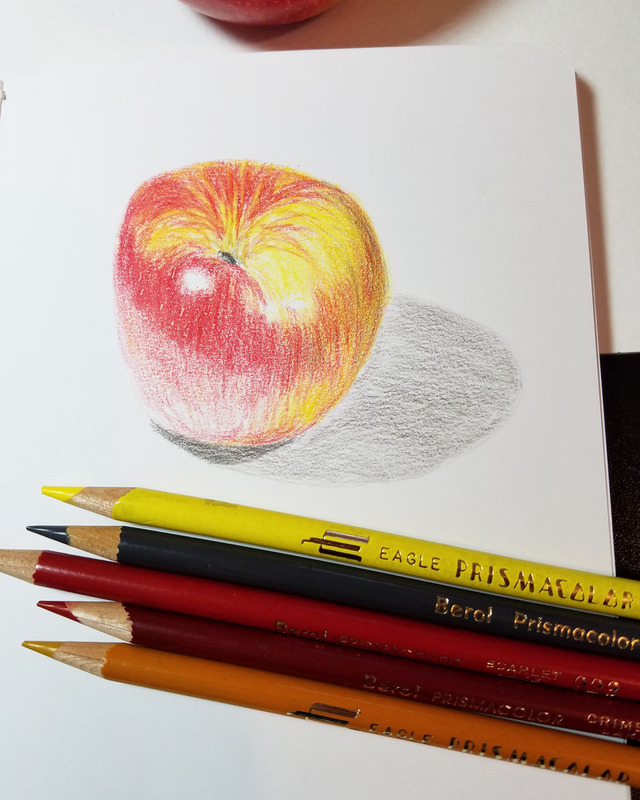 While I have plenty of colored pencils with soft hex and round barrels (and even one set of square), this is the sharpest hex colored pencil I’ve seen or used. They didn’t bother me while making this small sketch, but I think the sharp sides might get to me after a while if I were working for hours and hours on a large drawing. Given their hardness, I thought the Motifs would work well with Stillman & Birn Alpha, and I was right. 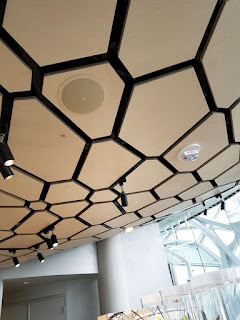 I was pleased that they covered the Alpha’s tooth nicely while still offering good point retention and detail. I didn’t use any Invaders in this test sketch because I felt the Motifs were sufficiently hard for details (but I think I would enjoy using the Invaders’ barrel more). As I felt about the Colorbrites, Wallace pencils are probably not ones I would continue to collect for use, but I appreciate having this selection of a brand name that no longer exists in the pencil world. I’m just going to sit here admiring the Motif logo and lamenting bygone typefaces. Almost all of the Eberhard Faber Colorbrites in my collection came to me unsharpened as new old stock from Ana Reinert after she’d heard that I was interested in vintage colored pencils. A couple came in the eBay mixed lot. The dozen or so display at least two logo and brand variations, and “Woodclinched” and “USA” are treated in slightly different ways. Most have a colored end cap that matches the hexagonal barrel color and a gold band; two have a grooved silver end cap. As when I was writing the Mongol post, I couldn’t find much historical information about Eberhard Faber except on Wikipedia, and even there it was a bit confusing. But I found nice images on the blog Pencils and Other Things that show a well-preserved boxed set with silver end caps. 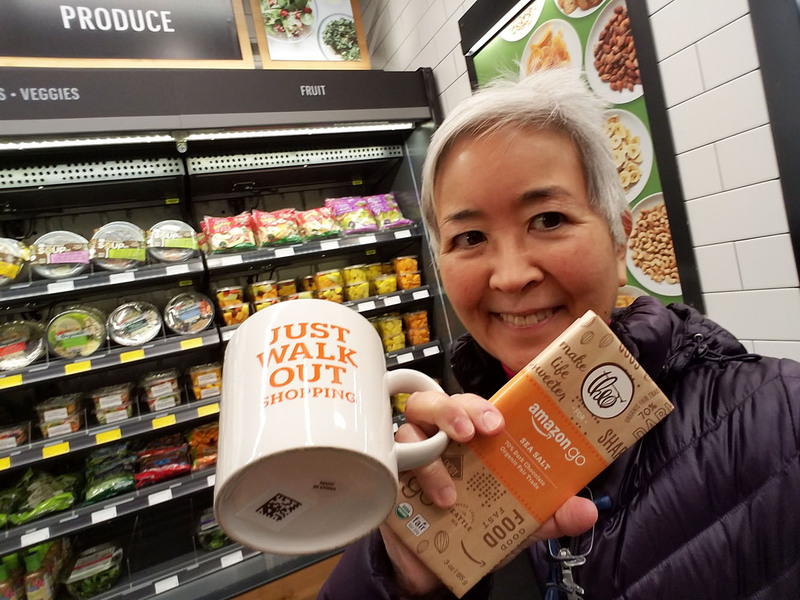 In that post, Sola notes that the red, yellow and green pencils say, “Recommended for print marking,” while the others do not. I spotted the same text on my Scarlet pencil but not the rest. 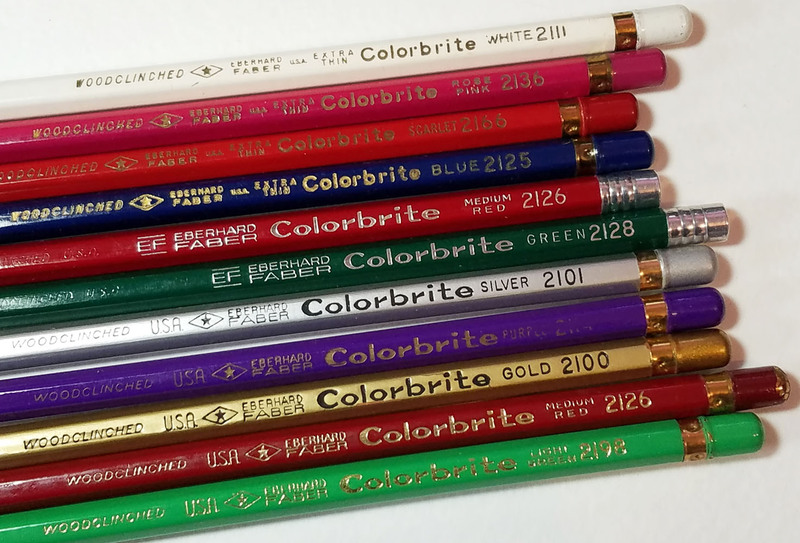 A blog commenter implied that pencils with the colored end caps were older than the silver. As far as I know, this brand is no longer in production, so unlike with Prismacolors, I had no expectations one way or the other. Test scribbles indicated that they were medium-hard, so I thought they’d be a good match for Stillman & Birn Alpha’s slightly toothy surface, where softer pencils can’t get into the texture easily. I had difficulty building up color, though, so I gave up halfway through a sketch and switched to the smoother Epsilon paper, which was better. 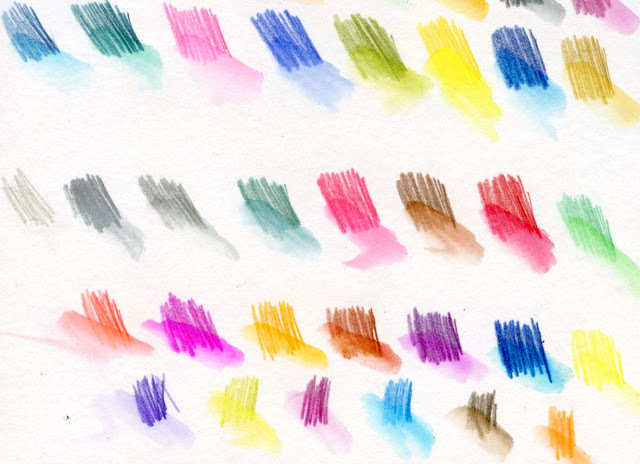 I usually find Epsilon to take softer pencils better, so I was a bit perplexed – to my hand, Colorbrites feel hard and retain a good point, yet they interact with smooth paper as if they are softer. I can’t explain that. 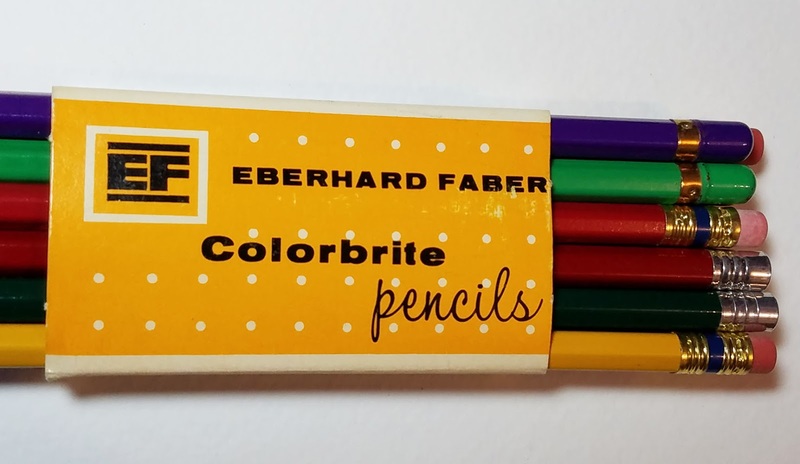 Colorbrites are probably not pencils I’d continue to acquire for use, but I love having these beautiful specimens along with the Mongols to represent the Eberhard Faber side of historic pencil manufacturing. 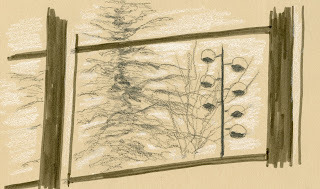 Rain streaming down the windows as it had been for hours, I was bemoaning the weather and not being able to go out for a sketch when Greg told me to come to the livingroom. 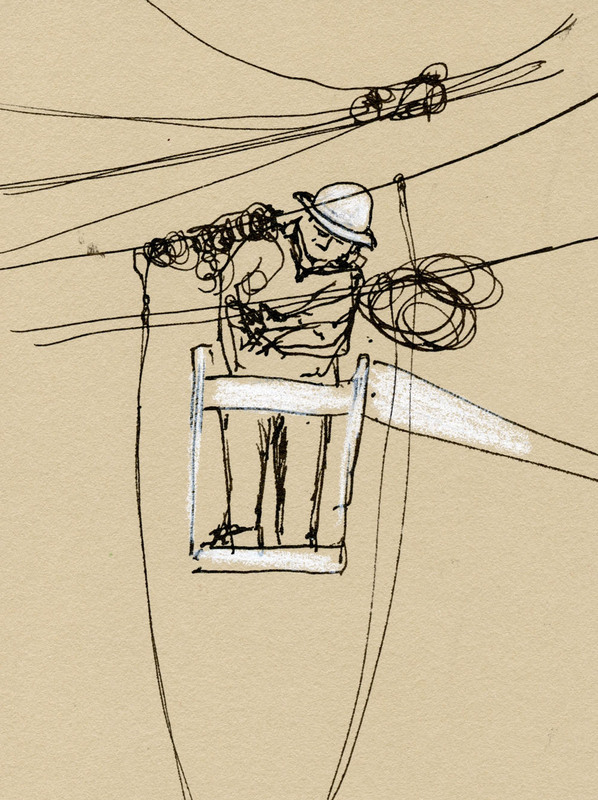 Through our large front windows, we could see a cable utility truck parked in front of our neighbor’s house. 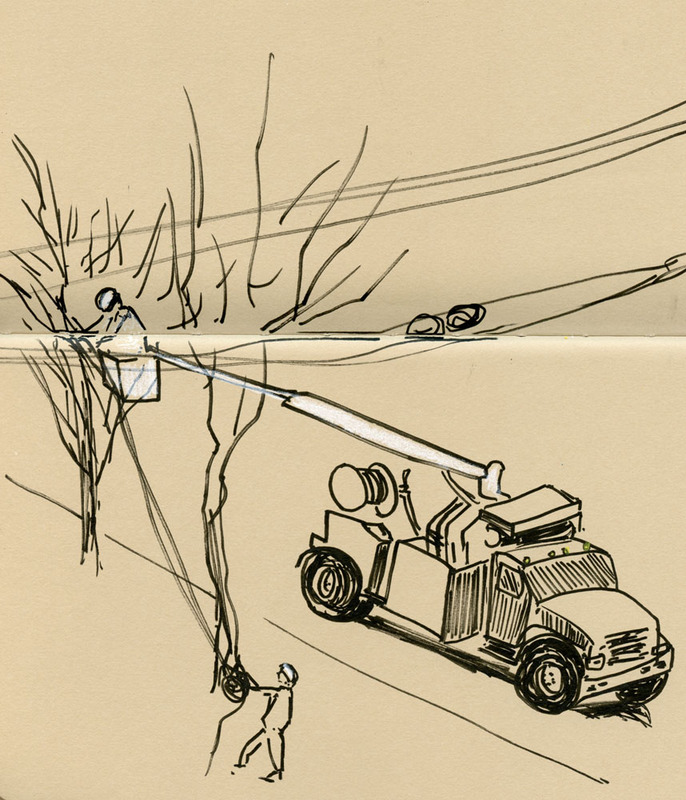 The cherry picker’s operator was struggling to string some cable through a tangle of the neighbor’s trees, even with helpers on the ground. 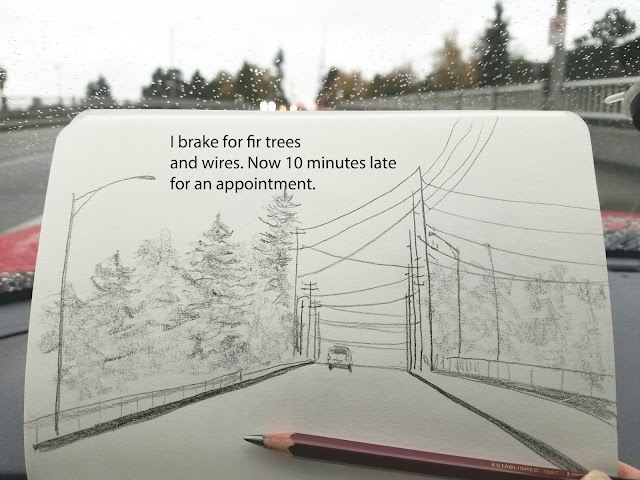 Their struggle gave me plenty of time to sketch the work. After a while, he took out some shears and clipped off a few branches, which made the job easier. 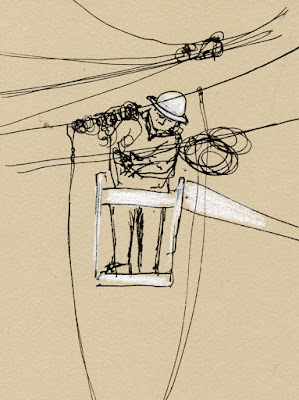 Eventually the team parked right in front of our house, which gave me a head-on view of the worker in the cherry picker. 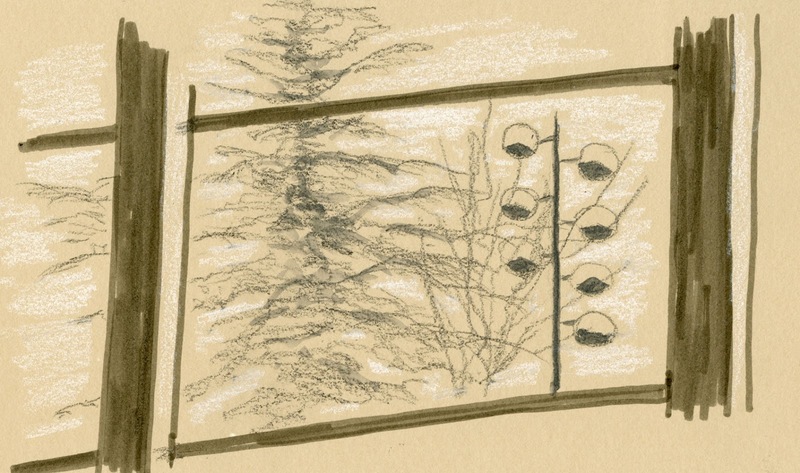 Luckily for him, we don’t have any trees, but we do have a tangle of loopy wires that is now even larger than before. I felt bad for them having to work out there on such a miserable afternoon, but on the other hand, I was happy for the entertainment. 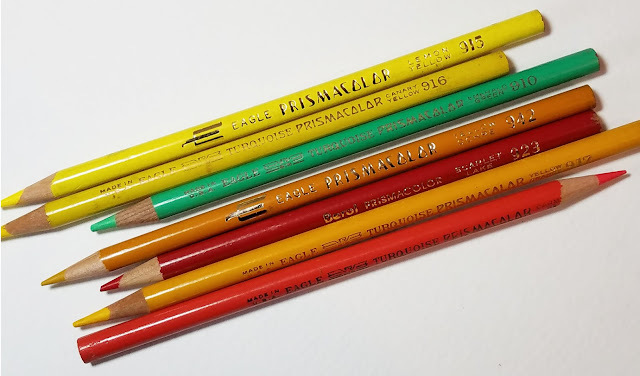 From a user perspective, the vintage colored pencil brand that interests me most is Prismacolor. They have long been favored by many, including fine artists and illustrators, for their creamy softness, rich hues and vast color range. 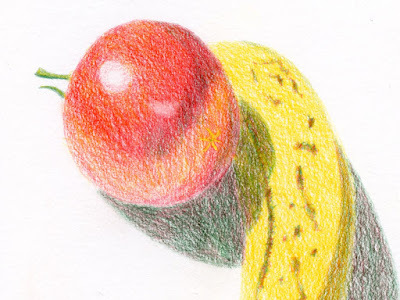 As I mentioned in my introduction, years ago I’d been frustrated by contemporary Prismacolor Premier pencils that I would sharpen and immediately break the cores – as if they were broken already even before sharpening. I sharpened entire pencils, one after the other, without hardly using them and eventually tossed the whole set (I didn’t even want to donate them to Goodwill and subject the next sucker to their flaws). That initial experience soured me to the Prismacolor brand, and I couldn’t understand why so many people loved them. Eventually I started learning that the people who loved them were using sets that had been made years ago in the US. Prismacolor was originally manufactured by Berol in 1938 (according to Wikipedia; the blog ArtPencilsRare also has historical info), which was founded by Eagle, and both names have appeared with the Prismacolor brand. Somewhere along the way (I can’t seem to find a definitive year), manufacturing was moved from the US to Mexico, and the quality declined. Pencils produced in the ‘90s and earlier seem to be in the safe zone of high quality. I have only a few Prismacolors in my vintage collection, but they display a variety of Eagle and Berol identities. (I know I said in my Mongol review that I love that logo best, but that top yellow one with the Art Deco logo makes my heart flutter. Don’t miss the lovely photo of Ana Reinert’s collection.) Prismacolors are unusual in that, to this day, they are unfinished on both ends. (Yay for the lefty who sharpened the bottom orange one!) Like their contemporary counterparts, the barrels are round. Vintage Prismacolors . . . I love that top logo! To complicate the nomenclature, the softer pencils I think of as Prismacolor came to be named Prismacolor Premier in contemporary parlance. 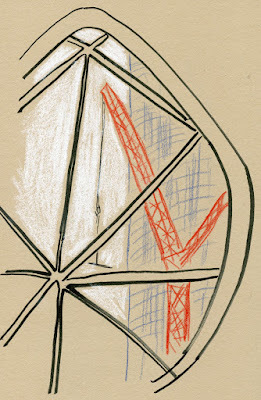 Its sister line, Prismacolor Verithin, is much harder than Premier and is intended for sharp, crisp detailing. 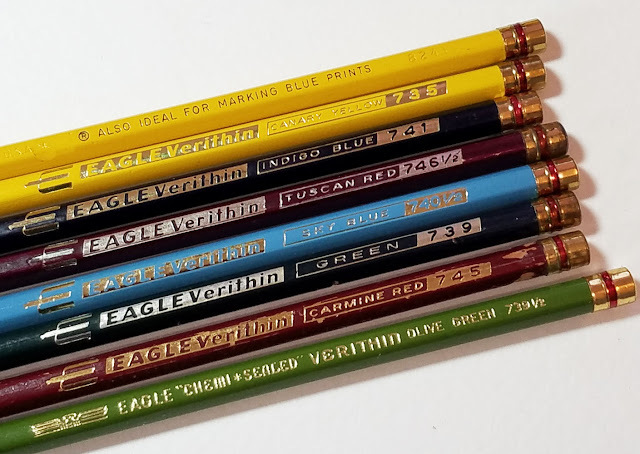 This is just a guess, but it seems like the Verithins came along with the Prismacolors in their various parentages, because my very small collection of Verithins displays different versions of the Eagle identity (I’ve also seen Berol versions online). Check out some of the funky color numbers: 746 ½? The indigo and yellow ones say, “Also ideal for marking blue prints” on the reverse. 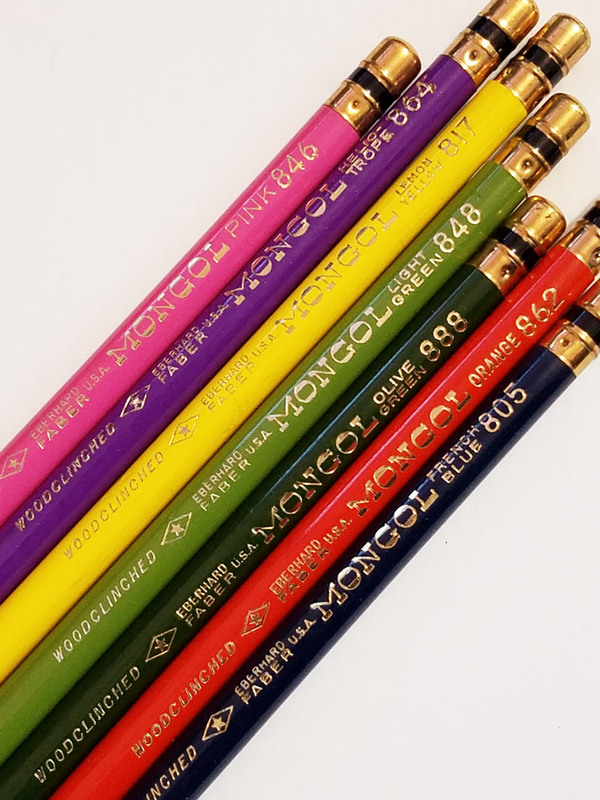 Unlike Prismacolors that are bare on both ends, hex-barreled Verithins wear a sporty banded metal end cap that looks similar to the Mongol’s. Vintage Verithins display different renditions of the Eagle logo. From my brief (and sporadic, between breakages) experience with contemporary Prismacolors, my vintage specimens apply with the same creamy softness that this brand is known for. 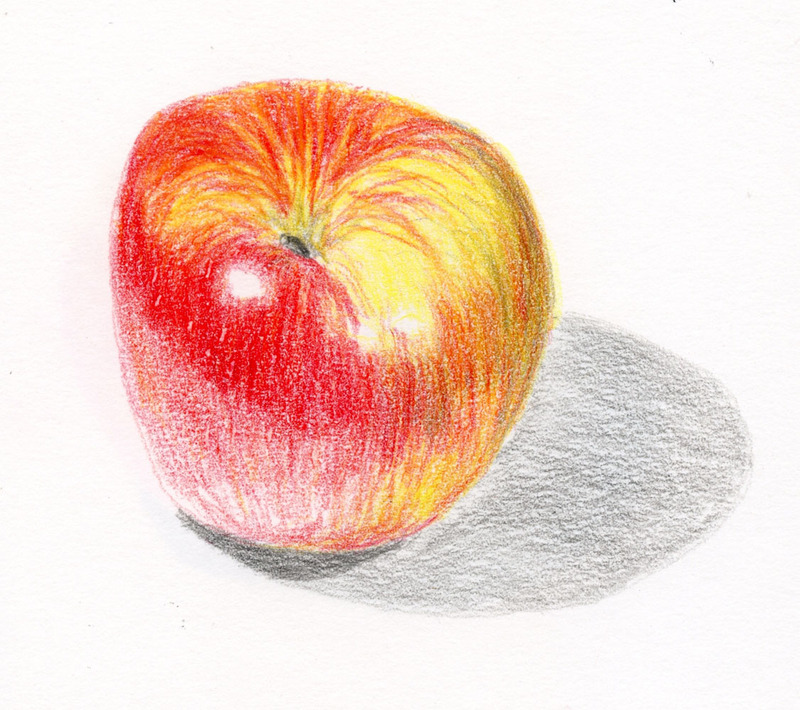 Since I knew the cores would be soft, I chose a Stillman & Birn Epsilon sketchbook, which has a smooth surface, for my apple sketch. Although it took multiple layers as expected, the pigments applied as richly as they probably did decades ago. (I read somewhere that colored pencils have a longer useable life span than most art materials; they never dry up, separate or decompose.) I didn’t use any Verithins in this sketch, but my sample scribbles felt the way I remember from contemporary ones. 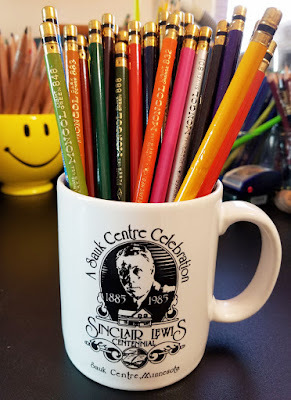 Although I’m not planning to collect vintage pencils simply to acquire them, I am going to hunt down a few more Prismacolors to use – a clear case of older being better. 1/21/18 Lots of sketchers at the giant chessboard! 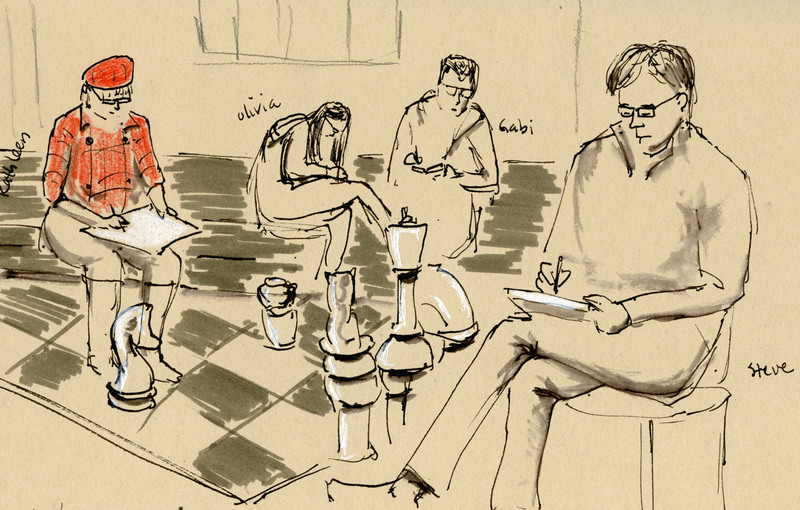 The giant chessboard is always an eye-catching focal point, and I managed to get Kathleen, Olivia, Gabi and Steve all in my sketch. 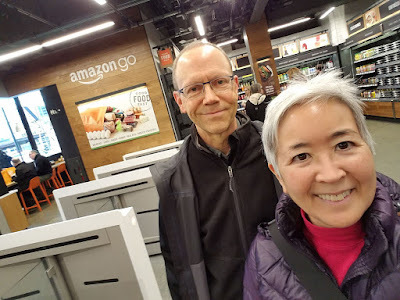 I spent so much time chatting with sketchers, including many I hadn’t seen in months and even years, that I barely had time for a second sketch. 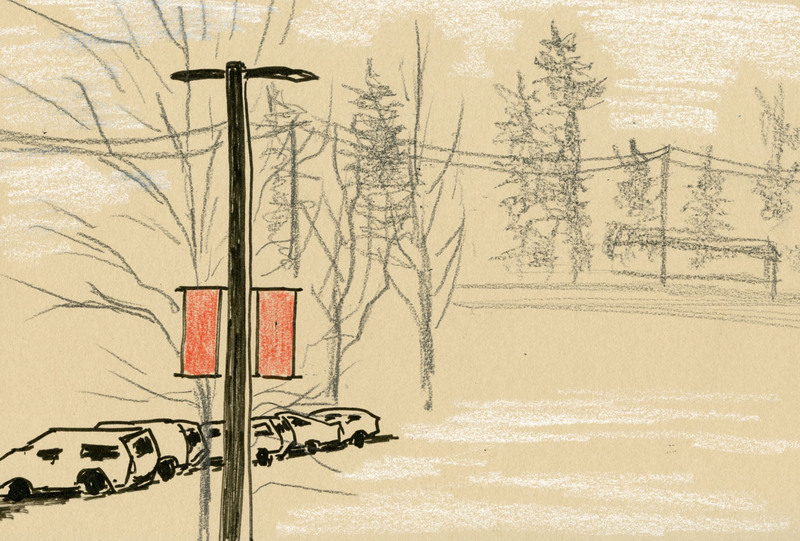 I wandered over to the large windows in the very back, which look out over the parking lot, power lines, and lots of fir trees fringing the main thoroughfare. I didn’t get a formal group photo, but here’s most of our group trying to get close enough to the throwdown to see the sketchbooks. 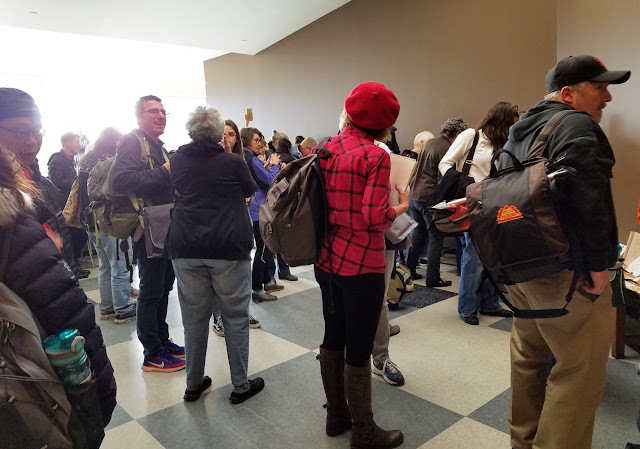 It was great to see so many sketchers on the first main meetup of the year! Queuing up to see the throwdown! 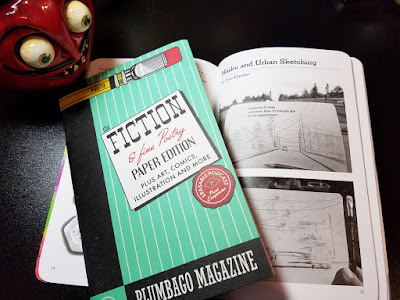 Plumbago is a periodic ‘zine published by Andy Welfle, a co-host of the Erasable podcast about pencils. 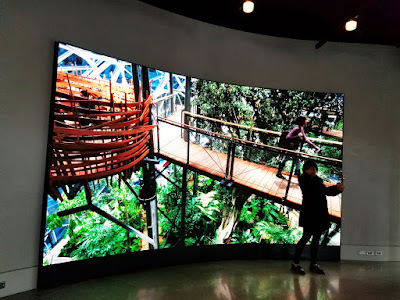 In issue No. 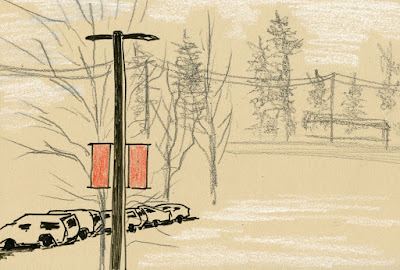 2 (now sold out) my blog post about the various ways I use Field Notes was republished. 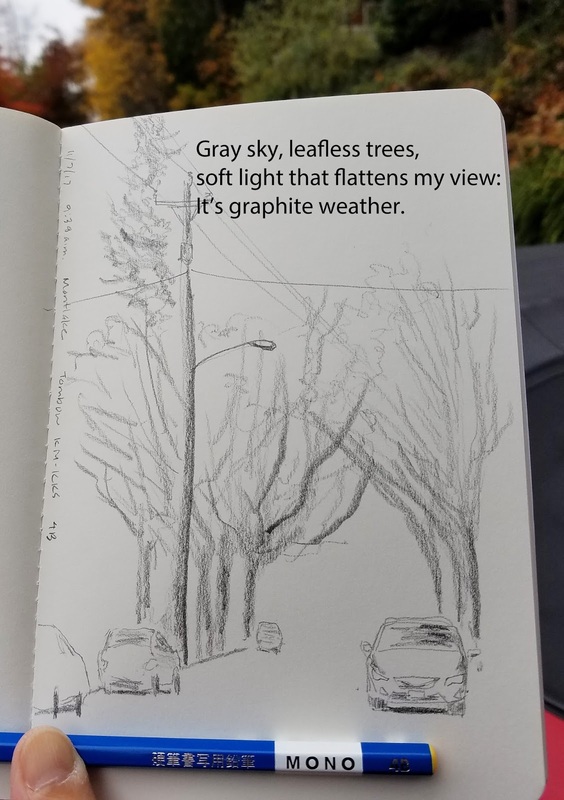 The just-released issue No.3 has a literary theme, so I submitted some urban sketches made with pencil and wrote a haiku to go with each. It’s been decades since I wrote any poems (I have a master’s degree in creative writing, but I stopped that kind of writing when I reached my 30s), so I did it as much as a personal challenge as anything else. Shown below are the three I submitted; the first two are published in Plumbago. All proceeds from this issue of Plumbago are being donated to victims of Hurricane Maria in Puerto Rico. I love the logo and typeface! 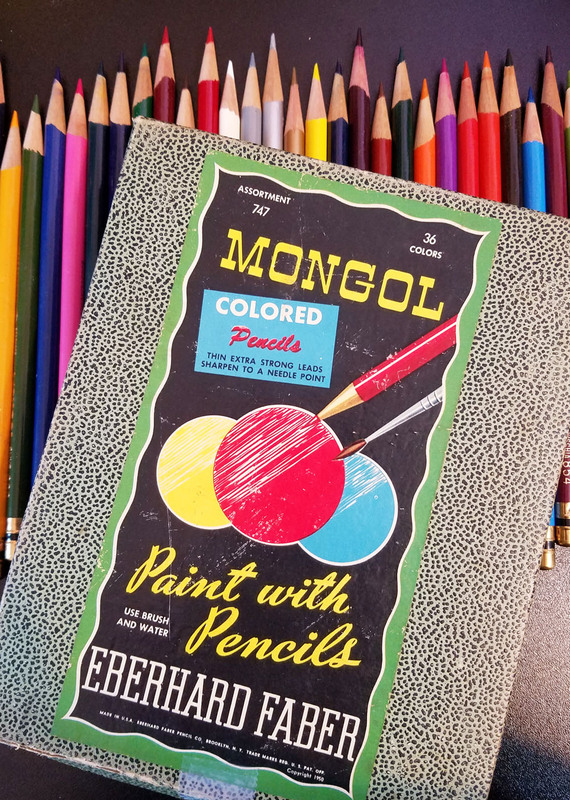 Of all the vintage colored pencils in my modest collection, the logo and typeface on the Eberhard Faber Mongol set are my favorite. They are identical to branding on Mongol graphite pencils of the same era (I assume) that I’ve seen online (Three Staples has good photos). 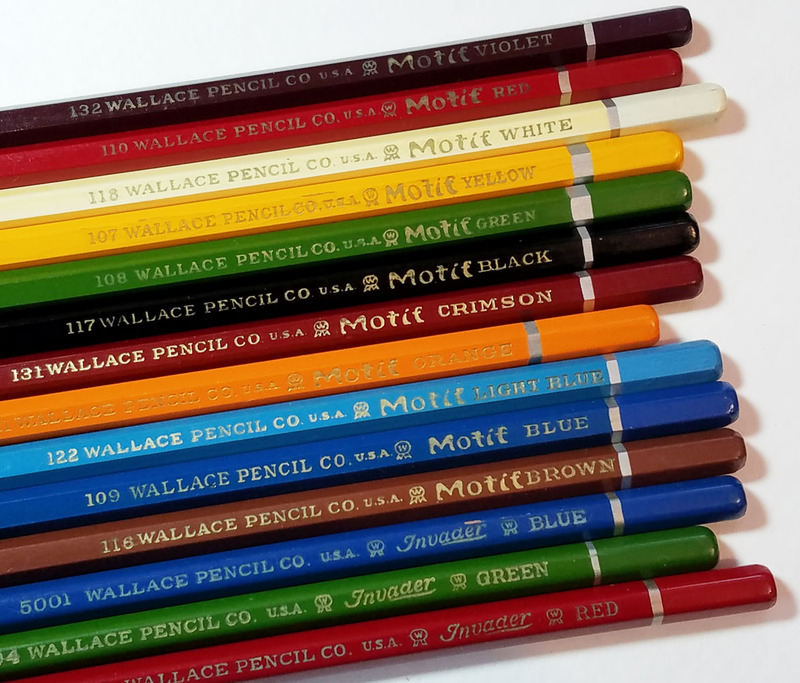 Instead of a ferrule and eraser as on the graphite pencils, the round-barreled colored pencils sport a jaunty brass-colored end cap with a black band. I wish I could learn more about these pencils, but most of my Internet searches led to their graphite cousins. The only water-soluble pencils in my vintage collection, the almost-complete set of 36 came as part of an inexpensive mixed lot I found on eBay. The box they came in is rather tattered and fragile, but it can open up to form a hinged stand (shown well on Rad and Hungry’s blog). The copyright date says 1950; made in the USA by Eberhard Faber Pencil Co., Brooklyn, NY. Unfortunately, they aren’t watercolor pencils I am encouraged to use. 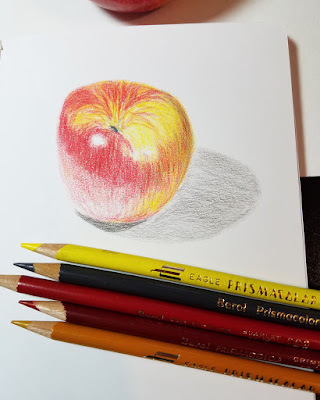 After swatching the colors, I didn’t make a sketch sample as I did with my other vintage pencils. The Mongols apply very hard and dry, both the dry and the washed colors lack intensity, and the pigments don’t dissolve easily. They remind me of novelty pencils or inexpensive sets made for kids. I’m not disappointed, though. I treat these pencils like flowers; they don’t have to do anything but be pretty and increase my happiness. 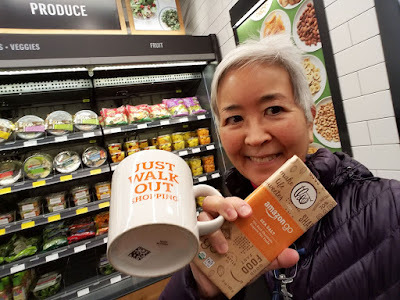 Edited 9/8/18: I spotted these pencils in the film The Post!